Much has been written about Daktari being filmed at Africa USA, a simulated jungle compound in California’s desert-like Soledad Canyon. 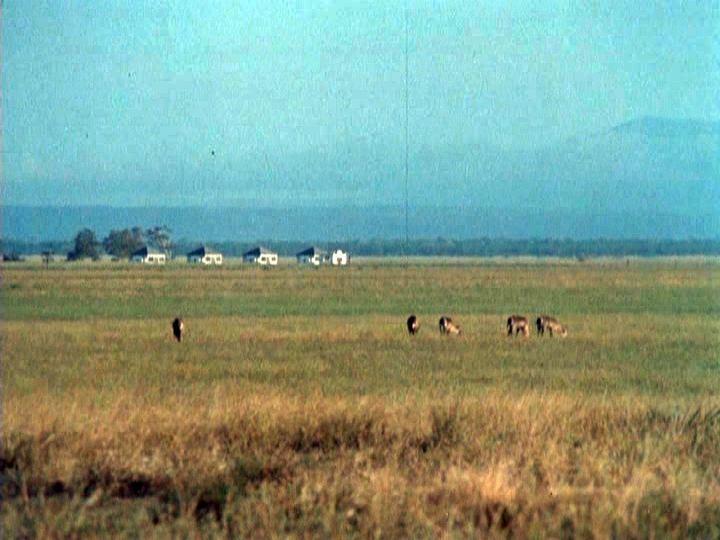 These sequences were usually edited with stock African footage. 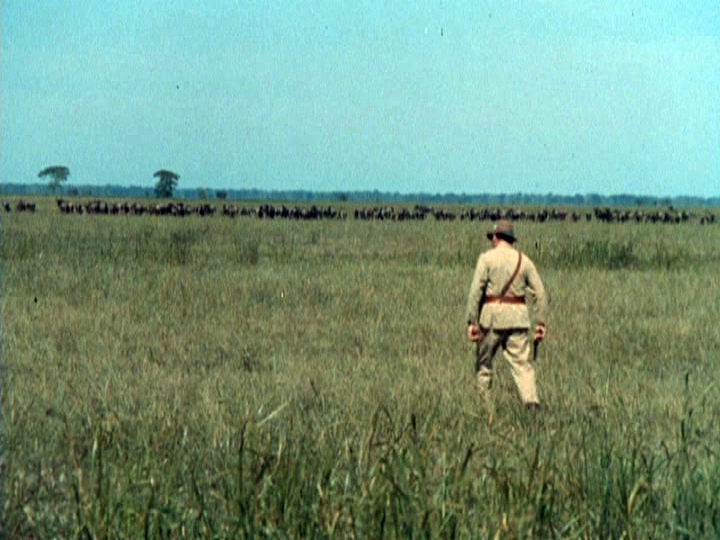 However, during the production break between the First and Second Seasons, Marshall Thompson and a film crew visited the ‘real’ Africa and filmed background scenes of him with animals, in the bush and with natives in their villages. These sequences were edited into at least eight episodes to give the series an authentic look that added to its appeal. 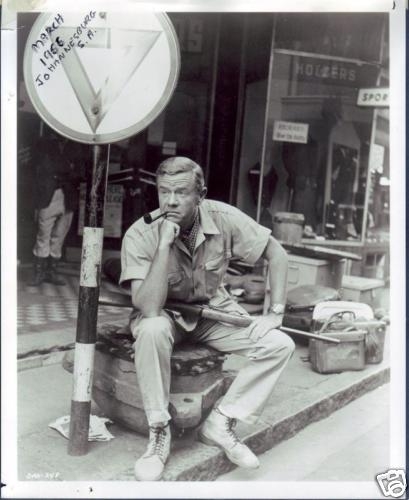 Marshall Thompson’s fascination with Africa became a reality in 1957 when he was chosen for a role in the film East of Kilimanjaro which demanded four months of shooting on-location in Kenya and Tanganyika. 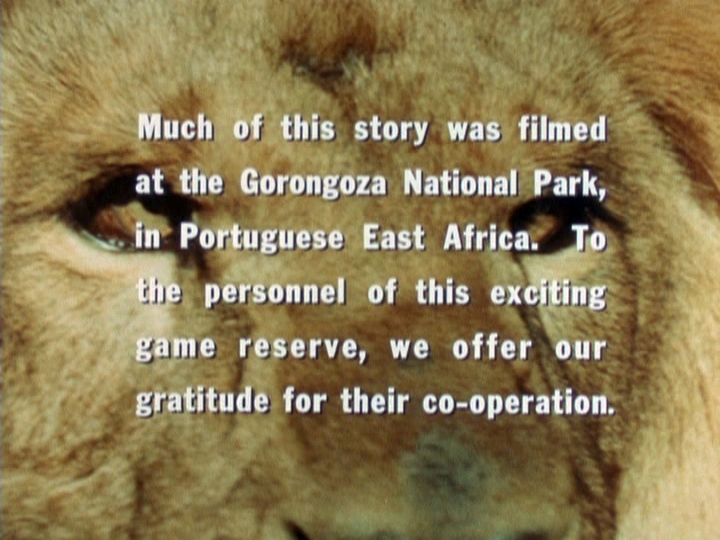 There is a strong possibility that unused animal and African village footage from East of Kilimanjaro was used in Daktari and, most certainly, in the film that spawned the series – Clarence, the Cross-Eyed Lion. In particular, the opening scene of Kilimanjarois almost identical to the opening of Clarence. Most significantly, the scene where Thompson’s character has a close encounter with a rhino was inserted directly into Clarence. Thompson returned to Africa for another four months to what was then the Belgian Congo and brought his wife Barbara along. However, a recently discovered 1966 newspaper article has provided much more detail of this event. 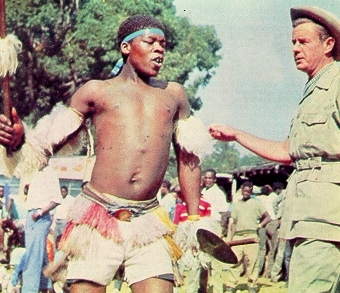 Daktari was regarded as a solid hit after its mid-season debut and screening in January-May 1966. 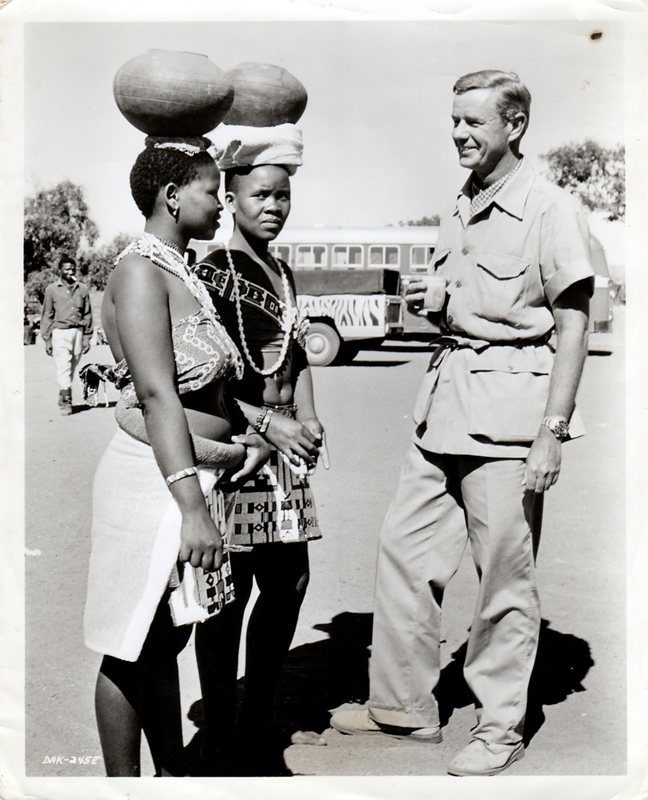 The announcement of its Second Season contained the promise of something new as a result of the first safari to Africa ever undertaken for a television series. 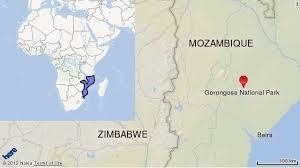 Kaufman and associate producer Ralph Helfer joined Thompson to travel to Mozambique for scenes to be filmed with the Zulu tribes of South Africa. They actually became the first TV unit to make films in the Gorongoza National Park and, later, they also worked in the private game reserve of Mala Mala. Among scenes that would ultimately be highlights of the Second Season were bull elephants charging at 30 miles an hour and the Zulus of Matavela lining up to greet Thompson. Daktari creator Ivan Tors had heard that a pride of lions had moved into a housing project near the Gorongoza National Park and so the camera crew went there to photograph them. Several abandoned houses were occupied by lions who had taken over the clean shady buildings. It was like a lion city, and the film crew’s presence did not seem to excite them or make them aggressive. The footage from this filming expedition ultimately became a major sequence in the “House of Lions” episode. A total of five weeks was spent on this safari for Daktari footage. Thompson then returned to California with 50,000 feet of exposed color film to shoot the bulk of the Second Season at Africa USA. 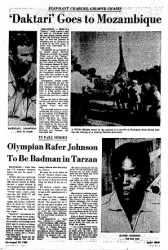 Although the exact date of the five-week African shoot has never previously been documented, a recently discovered picture of Thompson in Johannesburg dated March 1966 actually pinpoints the period he made this visit. 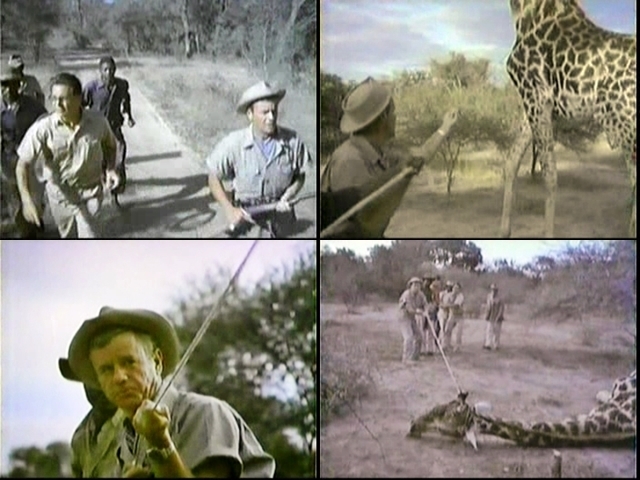 2.5 (23) “Cheetah at Large” (First aired 11 Oct 1966) On-location African footage of Marshall Thompson is featured for the first time. 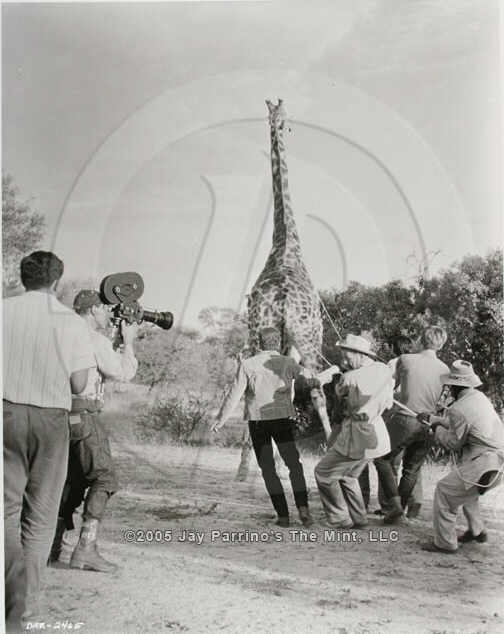 2.8 (26) “The Trial” (First aired 1 Nov 1966) The first on-location shots of Thompson filmed with natives in an African village are seamlessly edited into footage at Africa USA. 2.11 (29) “Shoot to Kill” (First aired 29 Nov 1966) Features on-location African footage of Thompson in the bush plus him getting out of a truck at a real African village. 2.13 (31) “Clarence the Killer” (First aired 20 Dec 1966) Several scenes filmed on-location in Africa are used (even one of a figure dressed as Hedley searching the African bush). 2.17 (35) “House of Lions” (First aired 17 Jan 1967) Features extensive scenes of Thompson filmed in Africa wandering outside abandoned two-storey houses built for mining surveyors. For the only time in the series, the credits acknowledge the filming location. 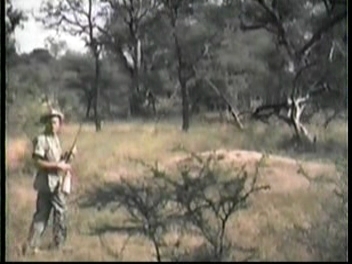 2.22 (40) “A Bullet for Hedley” (First aired 21 Feb 1967) As in Episode 2.13, authentic footage of a game warden (supposedly Hedley) walking on the African savannah is shown. 3.1 (48) Judy and the Astro-Chimp (First aired 5 Sept 1967) As in Episode 2.11, footage of Marshall Thompson on-location in Africa is used again. ← The next Clarence the cross-eyed lion? Meet Egon, the cross-eyed siamese kitten! Wow nice and detailed article here. Marshall Thompson seemed to have enjoyed greatly doing the show! Loving the white and black pics of him. He was really vested in that show, and it showed. Season 2 was so much better than Season 1 and I wish they could have continued in that vein.